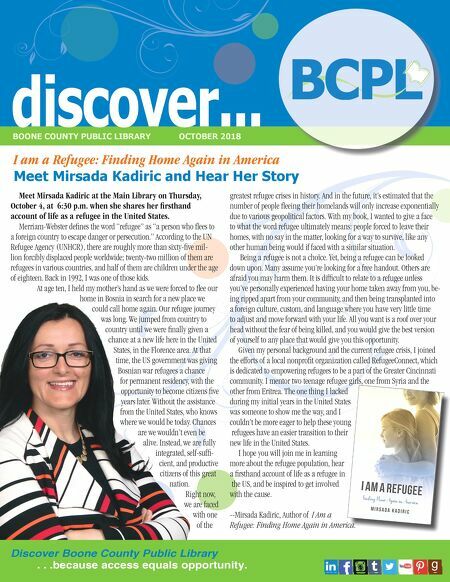 discover... BOONE COUNTY PUBLIC LIBRARY OCTOBER 2018 L Boone County Public Library BCP Meet Mirsada Kadiric at the Main Library on Thursday, October 4, at 6:30 p.m. when she shares her firsthand account of life as a refugee in the United States. Merriam-Webster defines the word "refugee" as "a person who flees to a foreign country to escape danger or persecution." According to the UN Refugee Agency (UNHCR), there are roughly more than sixty-five mil- lion forcibly displaced people worldwide; twenty-two million of them are refugees in various countries, and half of them are children under the age of eighteen. Back in 1992, I was one of those kids. At age ten, I held my mother's hand as we were forced to flee our home in Bosnia in search for a new place we could call home again. Our refugee journey was long. We jumped from country to country until we were finally given a chance at a new life here in the United States, in the Florence area. At that time, the US government was giving Bosnian war refugees a chance for permanent residency, with the opportunity to become citizens five years later. Without the assistance from the United States, who knows where we would be today. Chances are we wouldn't even be alive. Instead, we are fully integrated, self-suffi- cient, and productive citizens of this great nation. Right now, we are faced with one of the greatest refugee crises in history. And in the future, it's estimated that the number of people fleeing their homelands will only increase exponentially due to various geopolitical factors. With my book, I wanted to give a face to what the word refugee ultimately means: people forced to leave their homes, with no say in the matter, looking for a way to survive, like any other human being would if faced with a similar situation. Being a refugee is not a choice. Yet, being a refugee can be looked down upon. Many assume you're looking for a free handout. Others are afraid you may harm them. It is difficult to relate to a refugee unless you've personally experienced having your home taken away from you, be- ing ripped apart from your community, and then being transplanted into a foreign culture, custom, and language where you have very little time to adjust and move forward with your life. All you want is a roof over your head without the fear of being killed, and you would give the best version of yourself to any place that would give you this opportunity. Given my personal background and the current refugee crisis, I joined the efforts of a local nonprofit organization called RefugeeConnect, which is dedicated to empowering refugees to be a part of the Greater Cincinnati community. I mentor two teenage refugee girls, one from Syria and the other from Eritrea. The one thing I lacked during my initial years in the United States was someone to show me the way, and I couldn't be more eager to help these young refugees have an easier transition to their new life in the United States. I hope you will join me in learning more about the refugee population, hear a firsthand account of life as a refugee in the US, and be inspired to get involved with the cause. --Mirsada Kadiric, Author of I Am a Refugee: Finding Home Again in America. I am a Refugee: Finding Home Again in America Meet Mirsada Kadiric and Hear Her Story Discover Boone County Public Library . . .because access equals opportunity.